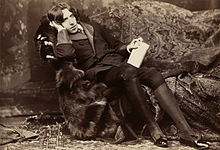 B' e Oscar Fingal O'Flahertie Wills Wilde (16 an Dàmhair 1854 ann am Baile Átha Cliath–30 an t-Sultain 1900 ann am Paris) na ùghdair Èireannach. Bha e a b' ainmeile mar dhràmadaiche nuair a bha e beò, ach bha e a' sgrìobhadh dàin agus rosg cuideachd. Bha e a' cleachdadh paradocsaichean gu leòr - b' esan, còmhla ri G. K. Chesterton, aon de na sgrìobhadairean a bha gan cleachdadh as motha. B' e Oscar Wilde na dhuine soirbheachail agus cudromach anns an deireadh 19 linn air sgàth nan dealbhan-cluich a bha e a' sgrìobhadh. Mar as àbhaist, 's iad aoirean làn de còmhradh sgaiteach is beur, agus thathar feadhainn dhiubh gan cluich fhathast, as trice The Importance of Being Earnest. 'S e The Ballad of Reading Gaol an dàn as ainmeile aige. Chaidh Wilde a chur am prìosan airson dà bhliadhna ann an 1895 airson eucoirean co-sheòrsach agus sgrìobh e an dàn an dèidh dha am prìosan fhàgail. Tha e a' smaoineachadh air peanas-bàis ann. Sgrìobh Oscar Wilde grunnan sgeulachdan goirid, an dà chuid àbhachdach (m.e. Lord Arthur Savile's Crime) agus brònach (m.e. The Happy Prince), na tha a' nochdadh an clò mar chruinneachaidhean gu seo. Rinn e cuid mhath dhiubh airson cloinne. Cha do sgrìobh e ach aon nobhail, The Picture of Dorian Gray, ach tha ise am measg leabhraichean clasaigeach an-diugh. Air a tharraing à "https://gd.wikipedia.org/w/index.php?title=Oscar_Wilde&oldid=542242"
Chaidh an duilleag seo a dheasachadh 19 dhen Chèitean 2018 aig 22:08 turas mu dheireadh.